From Taylor Jenkins Reid, “a genius when it comes to stories about life and love” (Redbook), comes an unforgettable and sweeping novel about one classic film actress’s relentless rise to the top—the risks she took, the loves she lost, and the long-held secrets the public could never imagine. Aging and reclusive Hollywood movie icon Evelyn Hugo is finally ready to tell the truth about her glamorous and scandalous life. But when she chooses unknown magazine reporter Monique Grant for the job, no one in the journalism community is more astounded than Monique herself. Why her? Why now? 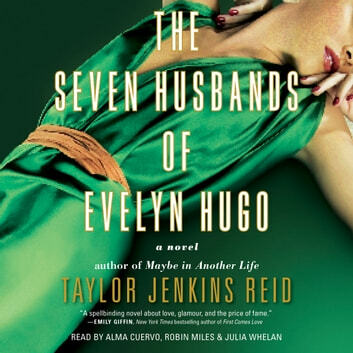 Summoned to Evelyn’s Upper East Side apartment, Monique listens as Evelyn unfurls her story: from making her way to Los Angeles in the 1950s to her decision to leave show business in the late 80s, and, of course, the seven husbands along the way. As Evelyn’s life unfolds—revealing a ruthless ambition, an unexpected friendship, and a great forbidden love—Monique begins to feel a very a real connection to the actress. But as Evelyn’s story catches up with the present, it becomes clear that her life intersects with Monique’s own in tragic and irreversible ways. Written with Reid’s signature talent for “creating complex, likable characters” (Real Simple), this is a fascinating journey through the splendor of Old Hollywood into the harsh realities of the present day as two women struggle with what it means—and what it takes—to face the truth. Not the story I was anticipating loved the twists and historical components.